It’s time for the little red chicken’s bedtime story —and a reminder from Papa to try not to interrupt. But the chicken can’t help herself! Whether the tale is HANSEL AND GRETEL or LITTLE RED RIDING HOOD or even CHICKEN LITTLE, she jumps into the story to save its hapless characters from doing some dangerous or silly thing. Now it’s the little red chicken’s turn to tell a story, but will her yawning papa make it to the end without his own kind of interrupting? Energetically illustrated with glowing colors —and offering humorous story-within-a-story views —this all-too-familiar tale is sure to amuse (and hold the attention of ) spirited little chicks. The delivery is Catskill perfect; readers will fall hard for the antics of this hapless pair. 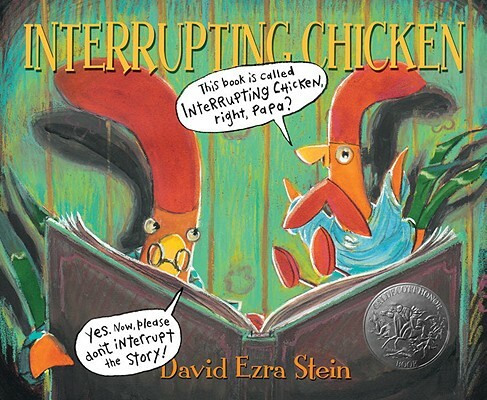 Stein uses page turns dramatically to build tension, which is released each time the chicken interrupts and amends a fairy tale…illustrations are vivid and dramatic. Great fun for reading aloud. This is one of the rare titles that will entertain both parent and child. This tender iteration of a familiar nighttime ritual will be equally welcomed by fond parents and those children for whom listening to stories is anything but a passive activity. The colorful illustrations and humorous tone make this book an enjoyable independent read or as a read aloud. This entire book is just as much fun as the title. A papa chicken can't get a word in edgewise in the lighthearted Caldecott Honor winner that proves patience is a virtue.